The evening started well for Vista Green. Wood Beasley III tried to dazzle the Northampton County Planning Board with visions of jobs, tax revenue and the return of prodigal youth to an area that is aging and short on economic opportunity. By the end of the evening, though, the half-dozen executives sitting in the front row looked glum. They shook their heads or stared at the ceiling as if they were trying to envision a different outcome. 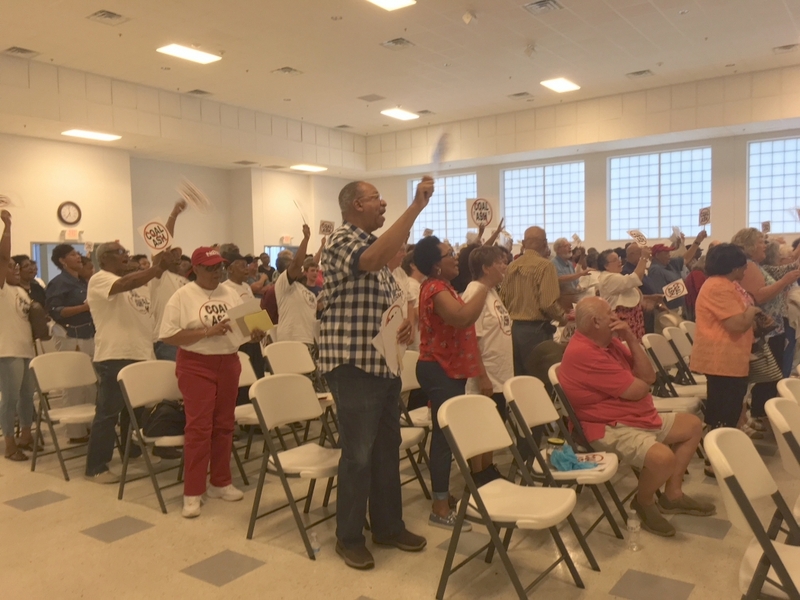 Behind them, more than 300 Northampton County residents, many of them wearing “No Coal Ash” t-shirts and hats, cheered as speaker after speaker had demanded that the board reject the company’s request. When will we stop people from dumping on Northampton County? With just 19,000 residents, Northampton County is 57 percent Black. Twenty-two percent of its residents live at or below the federal poverty line. Those two factors, as well as proximity to I-95 and the CSX rail line, have made the area attractive for polluting industries. The Atlantic Coast Pipeline enters North Carolina near the small town of Pleasant Hill. A compressor station for the ACP, with its attendant pollution, is being constructed there, as well. An Enviva wood pellet plant operates near Garysburg, adding to the environmental burden of existing mills and paper plants in the area. Vista Green, LLC, based in Bertie County, incorporated in June 2015, a little more than a year after the 2014 Dan River coal ash spill. State legislators had passed a law requiring Duke Energy to clean up its ash ponds, which included excavation. Dominion Energy, headquartered in nearby Virginia, also had to find a way to safely store its coal ash. A landfill seemed like a winning proposition. 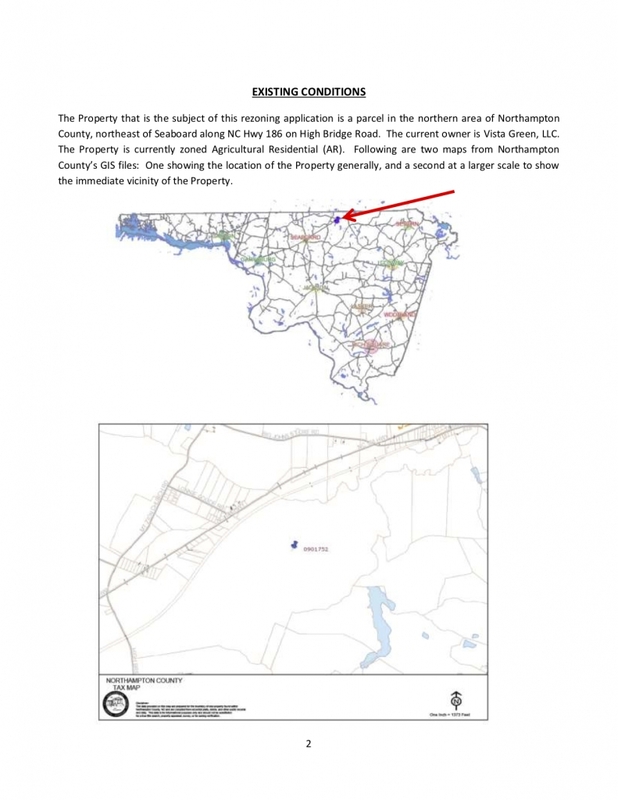 The company bought the 850-acre tract in Northampton County in December 2015 from a timber company, with hopes to build a landfill there. The rural area is lightly populated, but it’s not as if no one lives there. At least 120 people live within a mile and a half radius of the center of the site, including a strip of houses directly across Highway 186. From the property boundary, that number is closer to 200. People of color compose between 39 percent and 76 percent of those neighborhoods, according to the EPA’s Environmental Justice Screen. Northampton County residents opposed the landfill from the get-go. In early 2017, Vista Green withdrew its application for a Special Use Permit to build the facility, and instead regrouped to try to convince people the landfill would be safe. As the date for Wednesday’s planning board meeting approached, Vista Green had hung signs in downtown Jackson claiming that coal ash is non-hazardous. In fact, coal ash contains hazardous chemicals, including lead and arsenic; the EPA, under industry pressure, designated coal ash as non-hazardous. But it’s what people can’t see that is equally worrisome. Although the landfill would be lined, there is no guarantee that it wouldn’t leak. From there, the contamination could invade drinking water wells and groundwater, which nearby farms use to grow cotton, soybeans, corn and sweet potatoes. Vista Green officials told the board that no streams are on the site; however, a consultant’s report written for the board states there are several. And if another heavy, polluting industry wanted to share the site, there could be additional air emissions and truck traffic. After two hours of public comment, the planning board voted against the rezone because, technically, it would conflict with the county’s comprehensive land-use plan. In plain terms, that means the change would have dramatically altered the character of the area. However, the county commissioners still have the final say. And if they overrule the planning board, the NC Department of Environmental Quality would still decide whether to issue a landfill permit. 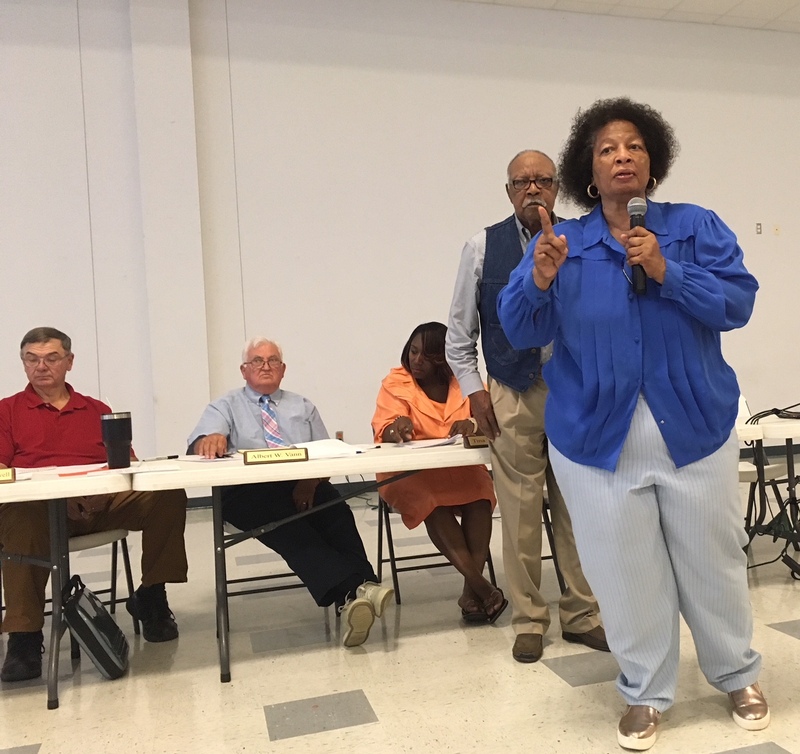 Although new federal coal ash rules could affect how the landfill would operate, DEQ could still choose to deny the permit, based in part on the cumulative effects on the community and the environment. As the crowd spilled into the parking lot of the county’s Cultural and Wellness Center, many of them hugging one another, several Vista Green officials stood in a grassy area, stone-faced and silent. They declined to comment.